Imagine a world where resources were limited to what was found in the classroom or the school closet known as the "Curriculum Materials Room." Picture a world where students wrote letters with pen and paper to communicate with other students and adults outside of the building. Due to postage costs, the teacher either sent the letters in bulk or paid for stamps out of his or her own pocket. Can you recall a time when student interests like skateboarding or video were never used as part of learning curriculum because the tools needed were either too expensive or not yet conceptualized? Do you remember a time when non-traditional learners struggled, and absenteeism meant a high likelihood of students doing poorly in school, and possibly having to retake the course? If you experienced none of these scenarios, then you live in a world of possibility because you grew up with the many social media tools available to support all learners. If any of these scenarios bring back memories as a teacher or student, then you understand that we have many more tools today to ensure that learners succeed despite struggles, because students and teachers have so much more available to meet every learner's needs. The list of social media tools to differentiate for learning is increasing. This updated post explores more tools. At the end, I've included a link to twice as many tools that have become available in the year and a half since original publication: 100+ resources. First, let's consider the important framework to successfully use these tools for and by the learners. Use fog-free assessments that track learner progress. While the collaboration capabilities of many social media tools can overlap, some may be more effective than others depending on how they're customized for student voice. Readiness focuses on a student's current academic skill level. Work is structured to help them address any gaps or needs for enrichment. Students work in like-skill groups for specific, targeted support to address a common need, such as guided reading or tiered (leveled) activities. They also collaborate in mixed-skill groups to support struggling students with needed skill development. Additionally, experiences can stretch the advanced students in a mixed-skill group -- they may have the core skills, yet the critical thinking challenges them and their teammates. Weebly, Kidblog, WordPress, Pinterest, Google Drive's folders, and OneNote are tools that you can use for creating center activities where students can work based on their skill support needs. Survey Monkey, Poll Everywhere, and Google Forms are just some of the many online survey tools for capturing pre- and formative assessment of students' progress. These are also good means for student feedback on the helpfulness of the intervention used. Allowing students to tackle work based on the option that makes the most sense to them is crucial for cognitive connections. Seeing a concept in context of a topic in which the learner has great interest -- and possibly expertise -- can help him or her turn abstract ideas into concrete purpose. For example, a young lady’s vlog series about her visit to a different country or maintaining and marketing a personal gaming channel opens up many possibilities for demonstration of skills in several content areas. Youtube Playlists: There are many videos that address content from different perspectives, including the one way that a particular student or teacher needs to see it. Create playlists (like this one) to provide that variety. Screencastify, Jing, and Snagit are tools that enable students to capture video of their screen. Video capture software allows students to use their resources such as gaming, coding, or productivity software, and capture it for video uploads. Here's an example using Minecraft: Building a Fusion Reactor from my Minecraft for Learning playlist. Zoom, Skype, and Google Hangouts are video conferencing tools that include recording. 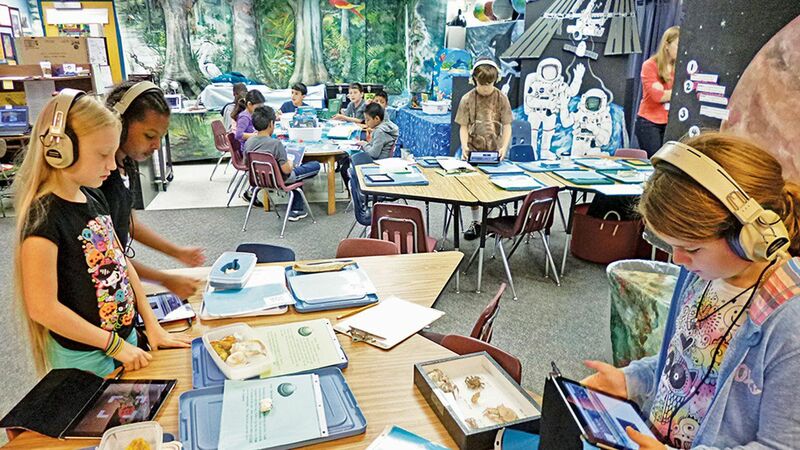 They enable students to connect with field experts on relating content to the world outside of school. Experts are more likely to participate in mentoring and sharing their knowledge when they save time by not having to travel to the school. When students address concepts from diverse perspectives, especially in collaborative groups, it can lead to in-depth understanding. Learning profiles are about providing each student with experiences that incorporate a variety of learning style elements, not just one. Such activities help students find deeper connections, especially if they share points of view via peer reflection and dialog. Thinglink uses pictures to place links in different locations where viewers can click to learn more. Here's an example. Piktochart lets you create infographics to offer a visual explanation of a concept or idea. Tackk lets you create small interactive pages or build a portfolio of work using different media tools. Moovly, MindMup, PowToon, and Dipity are tools that provide students with different ways to express their ideas, such as mindmaps, timelines, and video presentations. Give students a mix of tools and they will find what works best for them. Here is the complete list of 100+ social media tools for exploration. Consider which will best fit the current needs of your diverse learners. More will be added on a regular basis. What tools do you use? Please share in the comments section below. They'll get added to the 100+ list. We truly are in a brave new world -- the good kind -- where differentiation opportunities evolve due to the variety of social media tools available. No longer are students and teachers limited to resources purchased for the classroom. For example, 1:1 computing grows as schools understand the value of student contact with outside resources. As more schools allow students to use their "internet devices" (i.e. phones), learning options increase with access to social media apps and other online tools such as those mentioned above. In the past, limited access placed a hardship on teachers to meet the diverse needs of their students, especially when school resources were limited. In this brave new world, we are fortunate to live and work in an environment where the possibilities are endless for getting students what they need when they need it, and in a format that works best for them. How are you tapping possibilities to meet learner needs?